Adventurous, energetic Border Terriers possess the drive and stamina of a typical terrier: they were developed to keep up with horses and foxhounds while on the hunt for fox and other nuisance animals. These days Border Terriers have moved from hunting duty to indoor companion, now prized mainly as affectionate pets. But while they’re no longer a common choice as a hunting dog, they retain their high prey drive. The Border Terrier’s energy is well spent participating in Earthdog trials or agility competitions. A big personality—though occasionally a challenge—is one of the Border Terrier’s most endearing traits. The unofficial mascot of the Postal Service was a dog named Owney—many claim he was a Border Terrier. Owney traveled the United States and the world with the Postal Service between 1888 and 1897, and he was immortalized on a commemorative postage stamp. The Border Terrier was previously referred to as the Coquetdale Terrier or Redesdale Terrier. Coat - The Border Terrier's weather-resistant double coat consists of a dense undercoat and a wiry overcoat. The coat should not be wavy or curled. Though no breed is truly without the risk of an allergic reaction in sensitive individuals, because the Border Terrier's coat is low-shedding, it is considered hypoallergenic. The rugged little Border Terrier was originally developed on the border of Northumberland and Scotland in the 1700s. His features—a weather-resistant coat, loose skin, and legs built for running and digging—made the Border Terrier an indispensable companion for farmers who needed to keep fox from killing their livestock. The swift dog could keep up with the foxhounds and horses on the hunt, but was small enough to dig into the ground to bolt fox for the hunters to catch. They were also used to catch rats, otters, badgers, and other nuisance animals. The Border Terrier was accepted for registration in the kennel club in England in 1920, and the American Kennel Club in 1930. A big personality in a little body is what you get with the Border Terrier. Affectionate, intelligent, willing to learn, and eager to please—with an impressive determination and stubborn streak. They're typical terriers. Border Terriers appreciate time spent with their family, but don't demand attention. While obedient, they have a mind of their own. The Border Terrier is a good-natured choice for someone who enjoys the quirks that come with terrier types. Are Border Terriers Good with Kids? Are Border Terriers Good with Kids? Older kids are the best match for a Border Terrier as this dog's energy may be too much for toddlers and babies. As terriers, they may be territorial or have a short temper with kids who don't heed warnings that they've had enough. Are Border Terriers Good with Other Pets? Border Terriers may get along with other dogs in the home with proper introductions and socialization. They may be territorial with dogs they meet in public, but they aren't usually aggressive. They have a high prey drive and may chase cats, but can usually learn to live with dog-experienced cats who won't mind games of tag. Small animals and rodents aren't a good match for the Border Terrier due to its hunting instincts. The Border Terrier's predecessors were used to living and working beside horses, so this breed may do well on a property with horses. The Border Terrier is too small—and too friendly—to be an effective guard dog, but is alert and will sound the alarm if someone approaches the home. Their characteristic terrier energy keeps the Border Terrier going—through play, training sessions, trips to the dog park, and laps through every room in the house. They're often ready to go long after you've stopped. Indoor A Border Terrier needs plenty of exercise and mental stimulation to be well-behaved indoors. Though they're adaptable and adjust to most living conditions, including apartments, they will need time outdoors to exercise and burn excess energy. Outdoor The Border Terrier's wiry, weather-resistant coat keeps them comfortable outdoors in a variety of conditions, but they are not meant to live outside full-time. They have a desire to work and may take to excavating your flower beds or digging under fences if not given another job to do. Border Terriers should not be left outdoors alone as they are escape artists who love to wander. Exercise A fenced area to run and at least 30 minutes of exercise per day will help the Border Terrier burn enough energy to be happy and well-behaved. Endurance The energy necessary to keep up with a horse on the hunt has remained in the modern Border Terrier. This plucky companion has the endurance to participate in a variety of activities. 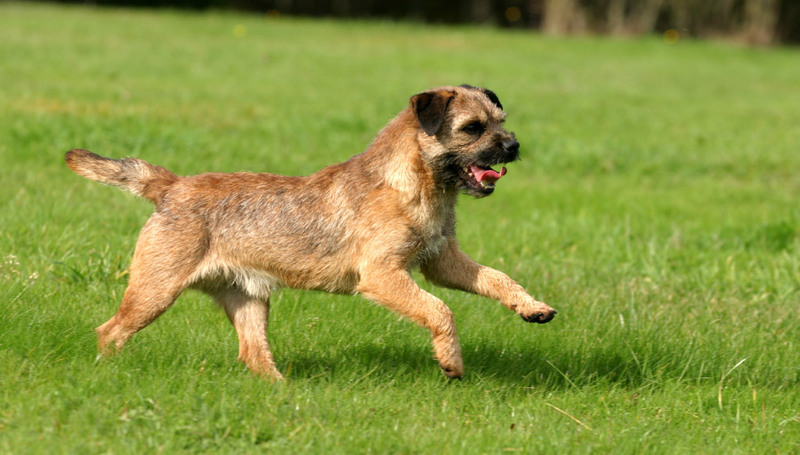 Running Miles: Border Terriers may be able to keep pace on runs of three to five miles, if well-conditioned. Hiking Miles: Adult Border Terriers in sound health may be able to hike five to eight miles, but they have a high prey drive and may be territorial so leashes are recommended. Food The general recommendation for how much high-quality dry dog food to feed an average weight Border Terrier is 1 to 1½ cups per day, split between two meals. While food guarding behaviors are not more prominent in the Border Terrier than in other breeds, children should never be allowed to touch or remove food while any dog is eating. Alone Time With enough exercise and mental stimulation—and possibly a crate—the Border Terrier may be able to stay home alone for four to eight hours per day. Barking or destructive behaviors may arise without enough exercise or attention. The wiry coat of the Border Terrier should be kept in a natural state for show-bound dogs. Weekly brushing and occasional hand stripping will help keep the weather-resistant coat in its best condition. Baths are necessary only as needed, as the coat releases dirt and debris naturally. Trimming nails regularly will help prevent painful splitting, cracking, or a broken nail. Terriers may be sensitive about having their paws touched, so get your Border Terrier used to it early. You can minimize serious health concerns in a Border Terrier by purchasing him from a reputable breeder who engages in responsible breeding practices, and through screening for common diseases and conditions. Intelligent and eager-to-please Border Terriers learn basic obedience with ease, but may not always choose to obey your requests the first time. Gentle correction and enthusiastic praise is the way to get what you ask out of the Border Terrier. Early socialization, a solid recall, barking only when necessary, and leash manners are imperative. Advanced tricks training and dog sports such as agility are perfect matches for high-energy Border Terriers. Jumping is one of the Border Terrier's favorite activities—show them the way around the agility course and they'll cheerfully leap their way through. They're often too independent to see the benefit of advanced tricks or obedience training, but with high-impact treats, they may be motivated enough to give it a go. Border Terriers excel at earthdogging, a popular hunting-like exercise. The former pack hunting dogs can perhaps be trained as a sporting dog for small game as they were developed for ratting and fox hunting. What is Canine epileptoid cramping syndrome(CECS)? CECS is a hereditary disease that affects Border Terriers. It was originally discovered in the early 1990s. It is also known as Spike's Disease. Though the cause is still unknown, there is evidence that it may be related to food or gluten sensitivity. Symptoms such as cramping, staggering, dizziness, muscle contractions, and neurological symptoms may occur. A gluten-free diet and avoiding egg, dairy, soy, and artificial ingredients have shown some promise as effective treatments for the condition, and some drugs have been used to treat cramping. Why is the Border Terrier's skin so loose? The Border Terrier's loose skin moves when grasped. The trait is required in the breed standard for this terrier alone. The loose hide has a specific purpose—it prevents injury while the Border Terrier is going to ground on the hunt: bites and scratches are less likely to cause damage thanks to the loose skin.